It's every mother's worst nightmare - that someone might take away their baby. But for Betty (not her real name) that threat was not just a bad dream, it was real - because of her disability. "Care from social services enabled me to have a relationship and a job," she says. "But when I was pregnant I didn't tell social services because I was terrified of the threat of what children's services might do." And it seems Betty's experience, though shocking perhaps, is not uncommon. The research, by the Tilda Goldberg centre for social work and social care, found children's social services too often saw the parent's impairment as a potential risk to their children. And they often prioritised "monitoring" over meaningful support that would keep families together and avoid interventions in a crisis. 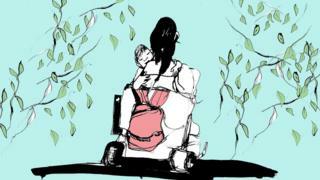 She says: "The fear you carry with you, which other [non-disabled] parents don't experience, cannot be understated. "If you are non-disabled, for the vast majority of people, the thought of social services involvement does not even feature. "But every disabled person I spoke to, when I was pregnant, had a concern. "There is always some implication because you have an impairment, that you may not be a fantastically good parent." "For the first 10 to 12 months while Sally wasn't mobile, my existing day-care package and support was enough," Betty says. "Once she moved on from milk and was mobile, it wasn't." One of the things Betty needed help with was making her baby's food. "It seems like such a little thing to make your child something to eat," she says. "But if you can't stand for long, and your hands don't work very well, it can be one of the most distressing things. "It was as if because I couldn't provide that, I wasn't competent as a mother." Eventually, she and her husband, Don, reached the agonising point where they had to do the very thing they had been fearing - contact social services. "You are in this position that you have explored all the other options and you have no other choice but to ask for help," Betty says. "But if you do so, if you call social services, it means you're opening yourself up to the potential that social services will look at everything and that your child might be taken away. "I didn't want to tell social services any earlier because I thought if they saw a thriving baby, they wouldn't be able to do anything to me. "But my baby didn't thrive, at the beginning. "My biggest worry was moving her about - I couldn't carry her and I couldn't bathe her." When they eventually made the call, to adult social services, they told her exactly what she feared - that the manager wanted to refer the matter to children's services, who are responsible for child protection. "When that contact came back, I remember ringing my health visitor and just sobbing hysterically. It was devastating." "I don't think that any parent sees being transferred to children's services as a positive thing." Fortunately, Betty says, the social worker she was allocated agreed Betty's need was because of her disability, not her competency as a mother, and therefore promised to stand firm against her manager's intention to shift the case towards children' services. With budgets being tight, the social worker thought her manager may have been keen to transfer some of the costs of Betty's care to another department. "As far as she was concerned [my] baby was thriving and I was a good mother," Betty says. Sue Bott, from Drill, says: "We know that resources are tight and health and social care professionals face complex demands. "But this isn't complicated. If they work with disabled parents, they can help support families to stay together, which is the best outcome for everyone." And this was the outcome in the case of Betty, Don and Sally - who is now two. "She's the greatest joy of my life - she's wonderful, happy and loved," Betty says. "And having social care support in her life means she is loved by lots of adults. "The care staff are like our extended family." But Betty adds sadly that as Sally grows, her needs will change and "the threat won't fully go away until she is substantially older".